This is how you will collect your donations. All donations will be transferred to your PayPal account. Then you can wire transfer them to your bank account or use PayPal’s debit card to withdraw from any ATM. PayPal charges about 3% from the amount of transaction. Note that PayPal does not allow adult related transaction so you should be very careful how you promote this service (more on this below). ChipIn is that site that specializes in donations. ChipIn connects directly to your PayPal account so all money will go there. 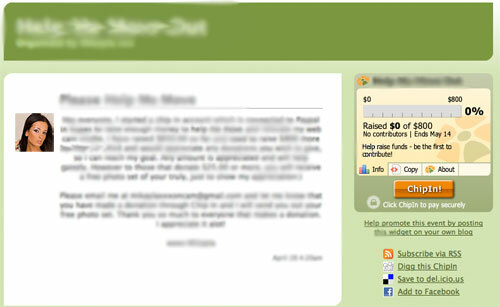 This is where you need to set up your profile with a picture and create an entry for donation. In the entry you specify what amount of money you are trying to raise and why you need these money so bad. You need to come up with an attractive title and short description of your donation campaign. For example you can write that you’re collecting donation for a new car, or perhaps you’re moving to another place and need money. Just use your imagination and you’ll come up with a lot of different ideas. When your blog’s fan clicks on ChipIn button it will take him to PayPal login screen. 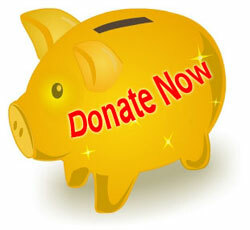 Once he logs in and enters the amount of donation, money will be instantly transferred to your PayPal account. If you have an account on Facebook, Twitter and other social networks this is the best place to promote your donation campaign. For example on Twitter you can post a tweet with a link to your donation every day. As long as you have a solid fan base your fans will spoil you with donations. Because Facebook and Twitter are non-adult oriented social networks all your donation transaction will be considered non-adult as well. That’s why you can safely collect money through your PayPal account. If you have blog you can write a short article about the donation with link to your special ChipIn page. When one of your fans makes a good donation you can write another post thanking this fan. This will make other fans to make donations as well which you can turn in some sort of competition. Also blog is a perfect place to put ChipIn widget in the top part of the sidebar so everyone sees it. One trick that really works is when you promise a free gift for the donation that exceeds certain amount. For example you can offer autographed poster of yours or a photo set that you will mail to everyone who makes the donations greater than $30. This will incetivise your fans to make a donation and very often they don’t ask for the gifts in return. Collecting donations is a great way to collect extra cash from your fans. It will take you few hours to set this all up and it could bring you thousands of dollars. To really take advantage of donations you need to have a solid fan base. That’s why it’s so important to have different places on the Internet where you are present (Twitter, Facebook, etc) and of course your own web site or blog. The only thing with paypal donations is that fans then have access to your real name AND address registered on Paypal. I’d like to know which mode allows models to stay anonymous. Thanks Mikayla for this great tip! Mikayla, now I know you are smart as well as beautiful! Thx for the info, luv! Hmmm I dont think is so good idea have a “fake” paypal account. If I’m not mistake time to time paypal ask for some personal information for check the identity. Paypal doesn’t allow adult transactions (see their TOS) and I know several people who were very careful about it but still had their money confiscated and accounts closed. I used this idea but ran into a problem. How do you get around the $600 limit paypal has for unverified accounts? Why can’t you open new account once your $600 limit is reached? It takes only a couple of minutes to set it up. Not only that but they’ll charge you $500 for violating their Terms of Service. I use alertpay. You can sign up for a business account with a fake name so they never see your real name or address. You’ll have to become verified first before you can send and/or receive money. This whole article and also several comments contain incorrect information and really bad advice! Even with two accounts, one fake one, it will not protect you. I’ve seen it happen. They will catch you eventually and confiscate y our funds as well as fine you. Not only will they freeze BOTH linked accounts and take any funds, they will often also freeze your bank account if you have it linked. It’s crazy how many have been warned about it but still insist on using Paypal and end up losing all their money. I see it happen every week. Why risk it? Alertpay allows adult and they won’t take your money. Hi can anyone tell me how you recieve payment via alertpay, i keep saying you need a button on your website etc, what if you dont have a website? can they just send payments with your payex email or somthing similar to paypal without having to open an account?